Ever since the DBPR's approval of the revitalization of declaration of covenants and restrictions the Club has felt emboldened and was quick to abuse their power by pursuing action against every individual who they perceive as a violator. 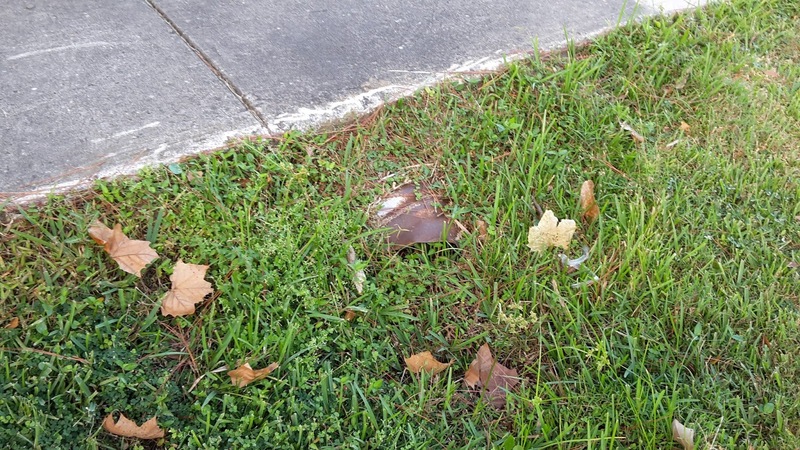 Whether demanding garbage cans be removed from sight or cars be removed from certain locations of one's property, they have decided that they are top cop in the neighborhood, which brings me to the topic of this post: their wrongful assertion regarding the covenants and restrictions. As we all know, the Club asserts that the restrictions are indeed lawful and that they have the authority to enforce covenants and restrictions. Others believe they don't, and this stems from a variety of facts backed up by case law and legal precedent. For instance, the Club never satisfied the requirements to amend the original covenants and restrictions in the first place. It was this amendment that they have insisted gave them the power to enforce restrictions on everyone. Another legal issue is the fact that the restrictions were expired, numerous homeowners were not member to the club, and in their revitalization paperwork they sought to encumber properties by placing restrictions on those properties retroactively. This of course is not legal. One cannot draft a contract and force another party to be committed to that contract by simply winding back the clock. For instance, a neighbor of ours had not been a member of the club for nearly half a decade. The club revitalized and in those documents stated that any property purchased after 2001 was now a member. They are now insisting that neighbor belongs to them. This leads me to the second point: the Club is misrepresenting the law and making claims that are 100% false. 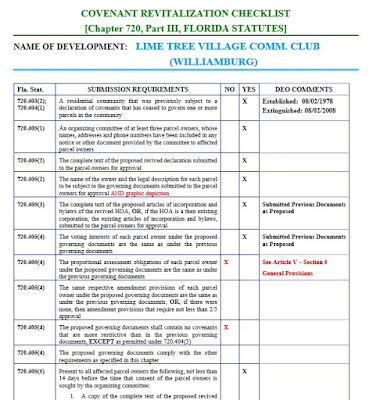 Upon the recent revitalization of Lime Tree's documents and covenants, via the MRTA application proces, ALL Lime Tree Village homeowners (club members and nonmembers alike) are required by Florida Statute 720 to conform to the Association's Covenants & Restrictions, By-Laws, and Rules and Regulations. They insist that the law gives them the authority to enforce any document - even corporate by-laws and rules and regulations - against non-members. The Club seems to conflate multiple statutes and documents into one generic rule - that they make the rules. This is incorrect. Florida Statute 720 governs mandatory HOAs with the authority to lien. As discussed previously on this website, the Club does not have the authority to lien (they used that as a selling point for revitalization). Also, per their revitalized declaration, they do not force membership upon every homeowner. The purposes of this chapter are to give statutory recognition to corporations not for profit that operate residential communities in this state, to provide procedures for operating homeowners’ associations, and to protect the rights of association members without unduly impairing the ability of such associations to perform their functions. Does it mention anything about non-members? Just consider their actions against non-members. Attempting to enforce arbitrary rules and collect fines, fees, or assessments, in which the benefits are only experienced by the membership. It does not sound as if the Club is looking out for the rights of every homeowner - just those who belong to their exclusive and discriminatory club. The law also states that associations would be subject to corporate law, and in the case of the Club, that would be Statute 617, which governs not for profit corporations. This law specifically states that only members are held liable to the corporation and not non-members like the Club insists. Also, while covenants and restrictions outline matters regarding the use of a property, articles of incorporation, by-laws, and rules and regulations involve the operation of the corporate body and their holdings. A by-law has no authority over a non-member. As a general rule, by-laws should not have sections that act as restrictions because then you run into situations that are highly illegal, like attempting to circumvent the law and utilize by-laws to pass covenants and restrictions that can impede the use of non-member properties. Since we are currently undergoing our national election process, remember the old phrase "taxation without representation" and now consider the actions of the Club. In their most recent newsletter they state that non-members must follow the rules that are made by the members and have no voice in the election process because only members (in good standing) are allowed to vote. So basically, the laws they claim give them authority specifically state they lack authority but they have decided to act using their own interpretations anyway. Did you think the government has got your back? While the Club has touted their revitalization approval in the newsletter, recent documents have shed light on the process. While the Department of Economic Opportunity determined the document the Club submitted was in compliance, they decided to ignore the fact that it did not satisfy statutory requirements. Notice the three red Xs where it states the document seeking revitalization does not satisfy submission requirements? While the Club's attorney did eventually provide the state with the missing governing documents, that still did not change the fact that the Department of Economic Opportunity found that the declaration was more restrictive than the previous governing document. But I presume they came up with that decision because they felt the documents provided by the Club showing that the Club was right was enough to satisfy their review (more on that below). In addition to their findings, they also to have claimed that they verified the signatures of the property owners, but even that was done poorly. 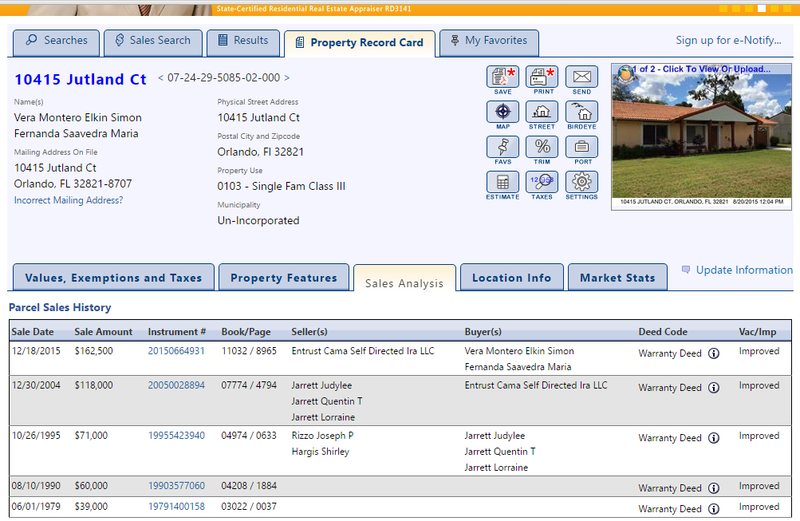 For instance, the state verified that he signature for the property at 10415 Jutland Ct. approved the declaration. They dated their approval as of January 25th, 2016 and state that the owners Simon Vera Montero Elkin and Maria Fernanda Saavedra approved of the revitalization. The problem is that they had purchased their property December 18th, four days after the department received the documents from the Club. There is no way the Department of Economic Opportunity verified the new owners approved of the proposed revitalization so what signature did they have on hand? 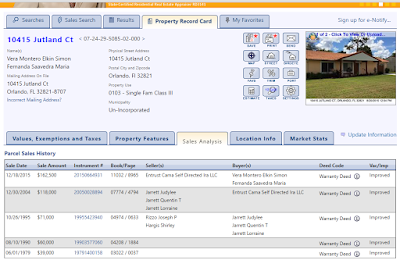 They had a months-old signature from the previous owner yet they stated they verified the signature of the property. How exactly did they do that? Especially when the signature not only had the wrong owner but was also not notarized? In fact all of the signatures received by the state were not notarized. So why did they state they were approved? Now this goes back to the previous point of how they deemed the revitalized declaration was not in compliance. Well, one of the documents the Club lawyer submitted to the state was an amendment made back in 2002 that granted the Club authority over every property. Not only that, it also significantly altered the voting interests of non-members (which the state surprisingly did not acknowledge). While there is significant case law to back up the argument that the Club is unable to confer authority over properties where no authority existed before, there was also the cold hard facts that they fudged the signatures granting themselves authority by submitting multiple signatures for individual properties and, like the case of 10415 Jutland Ct., they submitted signatures of people who no longer had a controlling interest in the properties the Club claimed they were given jurisdiction over. There is also the deeper legal argument that the amendment appears outside the chain of title for every property. When the restrictions expired so did that amendment (no matter how improperly done). So the only thing present in the chain of title is the original declaration so any amendment, such as one forcing homeowners into mandatory membership would be considerably more restrictive than the only document on file that existed at the time the properties were conveyed, meaning the amendments cannot be part of the revitalization process. There is also the other issue of the fact that since the restrictions expired, the revitalized declaration cannot force those homeowners who were not members but owned after 2002 into eternal mandatory membership, but I digress. So when presented with this information - that the Club did not correctly amend the existing declaration of covenants and lacked and lacked standing to revitalize the declaration of covenants that had expired - what did the Department of Economic Opportunity do? They claimed they lacked the jurisdiction to interpret the laws (despite the fact that is exactly what they were doing when they declared the documents in compliance while not even verifying signatures) and referred the matter to the circuit courts to determine the validity of the 2002 amendment before they can rule on the validity of the 2016 revitalization. All of this because a corporation decided they wanted to tell people what to do with their properties and the state has made it easy for them to do so (see image where they allowed the Club to submit documents to help support their revitalization). Meanwhile if you are a homeowner you have to lawyer up and jump through a thousand hoops to try and rectify the matter. Have you ever had a dispute with a homeowners association (or one that pretends to be one) that had ever involved an attorney? Have you ever even had to find an attorney to look into matters regarding association living? If you haven't, then let me spare you the trouble - it is near impossible to find an attorney to represent individual homeowners. Let me be more specific - it is hard to find qualified attorneys to represent you as a homeowner fighting an association for one major reason - most attorneys and lawfirms opt to work for associations because that is where the money is. Sure they can make some money representing one homeowner but there is a lot more to be made from an association with hundreds of homes because instead of that one payday, each and every homeowner becomes a potential paycheck - and a profitable one at that. Here is another dilemma - because most attorneys familiar with HOA law work primarily for associations, they are fully aware that homeowners will have difficulty finding representation. On top of that, the state does not regulate associations and prefers to take the backseat on matters they do have jurisdiction over. This leaves homeowners in a precarious position and associations and their representation are fully aware of that. Take the case of Dagmaris Maldonado in Lime Tree Village. The covenants and restrictions expired on the properties of the neighborhood. The board of directors and their attorney were notified of this fact. That did not stop the club from pursuing liens and foreclosure against this homeowner for what amounted to a fraudulent and illegal debt. Several years later the club admitted that the covenants and restrictions expired and they lacked any lien authority, but sadly that homeowner was run out of the neighborhood. The club sent out in their newsletters all the wonderful things they want to accomplish but not once did you read about how they gave this person back their home that they illegally foreclosed upon. This is just one example of what can happen when an association and their legal representation go unchecked and the individual is unaware of their rights. This is where the "HOA Slayer" comes into play. Meet attorney Fred O'Neal - a Central Florida attorney who exclusively represents homeowners regarding HOA matters due to the fact that representing homeowners and associations would be a conflict of interest. Mr. O'Neal is an extremely qualified attorney who was instrumental in past successful cases against homeowners associations - including Lime Tree Village. Also, unlike other attorneys in the area who may represent homeowners against associations, Mr. O'Neal is very familiar with the villages of Williamsburg, meaning the level of detail you would get would be unrivaled. Now that the club feels empowered by the revitalization approval from the Department of Economic Opportunity they have decided to invent new rules. This shouldn't come as a surprise. 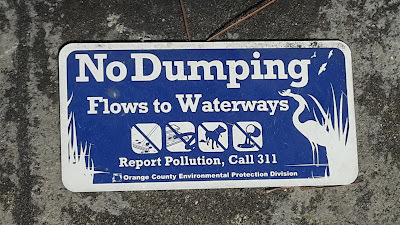 The association was fond of doing things they had no legal right to do, like filing liens and foreclose on properties despite lacking any legal authority to do so or dumping pool water into our storm drains because, heck, why not! Apparently, the club feels they can tell you how to park your cars. Now this may seem trivial but just think about it. The club insists that they have jurisdiction over the properties of Lime Tree. They claim this is possible because they gave themselves that authority with a 2002 amendment. They told the state during the revitalization process that they rule this neighborhood and they presented the state with a list of amended and restated covenants. Nowhere in those amended and restated covenants (or the original declaration) does there exist a prohibition of parking on the grass. This is a new rule the association has decided to create out of thin air and undoubtedly enforce. The folks who run the club have nothing better to do then create new rules to run the way you live your life. Not to mention they feel like they can get away with anything and nobody will stop them. This is why they attempted to enforce expired restrictions for 6 years, even foreclosing on a single mother because she did not pay them money (that they legally could not collect because the restrictions simply did not exist). Some may see this as "reasonable" but it always starts with something "reasonable." In nearby Sand Lake Hills, the association insisted their amendments were only a matter of $100 per year. What they didn't tell homeowners was that their amendments also granted them authority to access anyone's properties, make any changes they wanted, and stick the property owner with the bill plus various fees. Don't wait until it is too late. Before you know it the club will start dictating what colors you can paint your house, what additions can be made, what kind of roofing material can be used, and what kind of window treatment you hang. 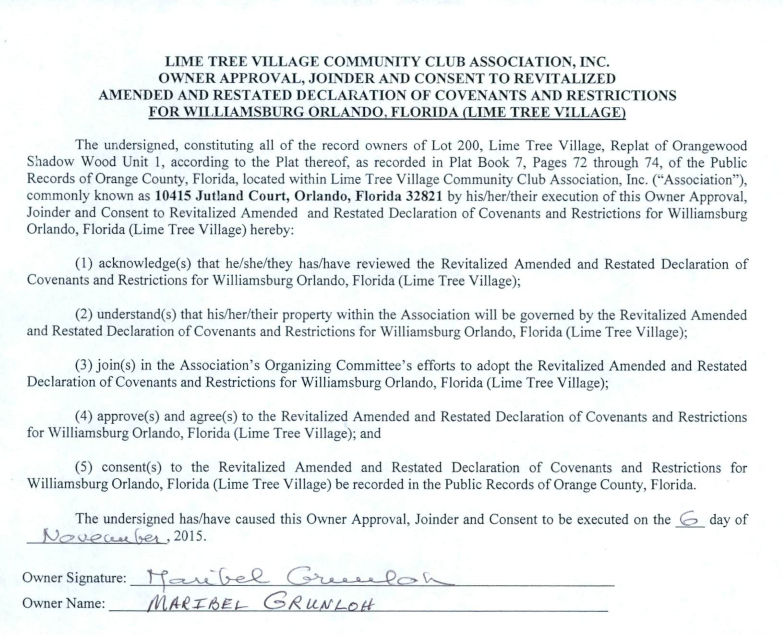 So by now you may have heard of the contested MRTA revitalized declaration, and if you haven't, you may be scratching your head at the recent enforcement letters the association had been sending out stating that "ALL Lime Tree Village homeowners (club members and nonmembers alike)are required by Florida Statute 720 to conform to the associations Covenants & Restrictions, By-Laws, and Rules and Regulations." Before I get too lawyer-ly, I just wanted to point out that the association only wants to follow the statutes when they are convenient. For instance, they cited MRTA and s, 720 in their letter. They want you to do whatever they say because, according to them, it is the law. But did you know the association did not even meet the qualifications of the law they claim gives them the right to govern your property? 712.11 "a homeowners’ association not otherwise subject to chapter 720 may use the procedures set forth in s. 720.403-720.407 to revive covenants that have lapsed under the terms of this chapter." 712.01(4) The term “homeowners’ association” means a homeowners’ association as defined in s. 720.301, or an association of parcel owners which is authorized to enforce use restrictions that are imposed on the parcels. 720.301(9) “Homeowners’ association” or “association” means a Florida corporation responsible for the operation of a community or a mobile home subdivision in which the voting membership is made up of parcel owners or their agents, or a combination thereof, and in which membership is a mandatory condition of parcel ownership, and which is authorized to impose assessments that, if unpaid, may become a lien on the parcel. The term “homeowners’ association” does not include a community development district or other similar special taxing district created pursuant to statute. 720.405(4)(e) “(4) The proposed revived declaration and other governing documents for the community shall: (e) Comply with the other requirements for a declaration of covenants and other governing documents as specified in this chapter. So based on s. 712 (MRTA) and s. 720, the association is not really an association because they lack the authority to put a lien on your property and not all parcel owners are obligated to become members. But here is where it gets even more detailed - the law defines what exactly is a "parcel," in regards to homeowners associations, which details even more about the requirements. Had anyone even read the association's original governing documents (or even their Amended and Restated Declaration of Covenants)? The association went to great lengths to detail who they may enforce restrictions upon. First, they defined an "Owner" as meaning "any other person, firm or corporation which shall acquire or own any Real Property in such form as may now exist or may be created from time to time." "'Real Property' means any parcel of land affected hereby." "Lot" means any plot of land shown upon any recorded subdivision map of the Real Property. Have you followed all of that? The association defined everything! Now what does it say about enforcement? "If the Owner or Owners of Lots with The Property, or any other person or persons, or any of them, or any of their heirs, personal representatives, successors or assigns, shall violate or attempt to violate any of the Covenants and Restrictions contained herein, it shall be lawful for any other person or persons owning Real Property situate within The Property, or the Lime Tree Village Community Association, Inc. to prosecute any proceedings at law or in equity against the person or persons violating or attempting" to violate the Covenants and Restrictions. So basically, their own restrictions they claim are valid are only valid against members who may have liens placed on their property should they fail to pay assessments. And we all remember what they said about liens, right? This doesn't really change much. Their revitalized documents are still illegal regardless of what the Department of Economic Opportunity said or did because the law is the law and the association has decided to pick and choose which definitions they deem fit for following. They do not meet the definition of an association, and by law, could not legally revitalize. So, by that rationale, they are also not allowed to enforce their bogus restrictions! Let me tell you a story about a neighborhood in Florida that was built in the late 1970s. There was a voluntary association and the declaration of covenants and restrictions didn't grant them authority over the properties. 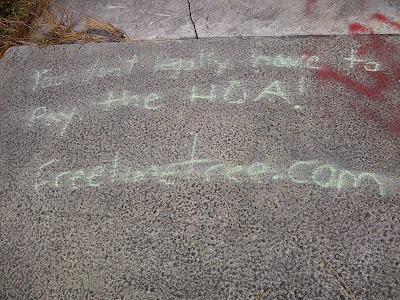 The HOA was merely a social club. Years later some of the homeowners decided they wanted a change and so they decided to amend the governing documents to force mandatory membership, require the payment of dues, grant the association jurisdiction, and allow for the collection of attorney's fees. This was all approved by 2/3rds of the homeowners, as required by the amendment process of the governing documents. 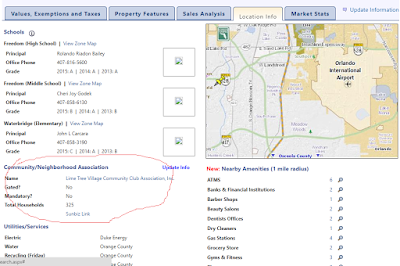 If you thought the neighborhood described above was Lime Tree Village think again. The association mentioned is the Holiday Pines Property Owners Association and all those things that sounded a lot like Lime Tree and the 2002 mandatory conversion amendment actually occurred over a decade prior. Why is this tale important? Whatever happened to Holiday Pines and their own mandatory conversion? Holiday Pines was involved in a huge court case that struck down their mandatory amendment back in 1992 - 10 years before Lime Tree did the same exact thing. This could explain why the lawfirm involved with Lime Tree, Larsen & Associates, told the board of Greenbriar at the time that such actions were a "gray area" of the law and would hold up so long as nobody challenged them. 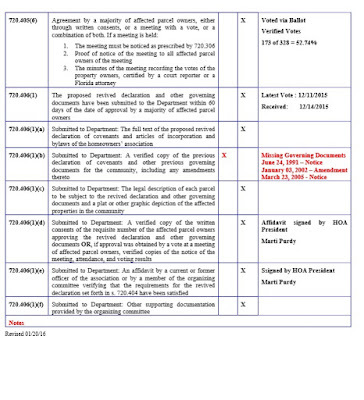 The club president even sent out letters stating a desire to amend because the association lacked jurisdiction. So what happened in the Holiday Pines case? Basically the case, ruled by the Fourth District Court of Appeals, stated that despite being initiated by the property owners, such a conversion drastically altered the scheme of the developement and substantially impacted the use of one's property without their consent. To put it in other terms, the association decided to rewrite the terms of the contract between property owners and the relationship they held with the neighborhood to the point that it was no longer recognizable as it once was. The court differentiated between the nature of homeownership and condominium and stated that such changes burdened homeowners and forced them into an association they never wanted to begin with. Lime Tree was established as a neighborhood with no mandatory association and a small list of negative restrictions. They even touted that fact in their promotional material. This case is important because it relates directly to the events that had transpired in Williamsburg ten years later. Legal reasoning would mean the mandatory amendment in Lime Tree would be invalid, and their revitalization attempt to be equally invalid. There are other reasons as to why the revitalization is unlawful. Florida statutes require governing documents to permit associations to have enforcement capabilities and lien rights - a power the association has openly admitted they do not possess. Not to mention the association never met the 2/3rd threshold to amend the declaration back in 2002 - a fact that has been overlooked for nearly 15 years. When Holiday Pines went to court the question of legality of such an amendment was unanswered. 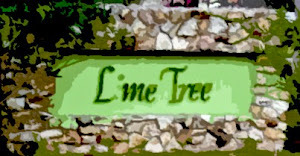 Should Lime Tree go to court there is no uncertainty what would happen. Lime Tree faces decades of statutory and case law, mountains of documentation proving fraud and malfeasance, and most importantly, the signatures of dozens of property owners authorizing a corporation to alter a contract that substantially burdens the use of one's home - a huge, costly liability. A how do you think a judge would rule when the same thing happened years ago and Lime Tree still decided to go forward? So the association has claimed they revitalized the documents. They touted the approval by the Department of Economic Opportunity as proof of their validity and they mailed out packets with their supposed revitalized restrictions. So what does this mean exactly? While they jumped through all the bureaucratic hoops the DEO doesn't do a detailed analysis of the documents they are presented with. The association provided them with a set of covenants and restrictions and that was that. The department rubber-stamped what they were given because what they were given looked official. While the department reviews the information given to them, they do not research them. When they were informed that the association did not provide them with all of the legally-required documentation they stated that they would not change their determination. This section requires the association to be defined as such under Statute 720. Now if they do not meet the definition set forth in 720 - as in being a mandatory association - then there is another condition that needs to be met, being they must possess authority to enforce the restrictions. 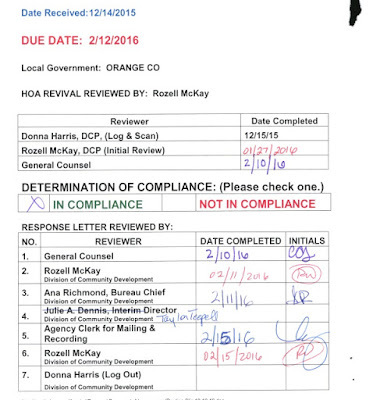 This leads to the reason why the DEO approved their documents - there is significant legal precedence in the State of Florida that require any such change in scope of a neighborhood, specifically granting an association enforcement authority and requiring membership and forced assessments, requires the full approval of the affected parcel owners. That is because making such changes are consider legally unreasonable and significantly restrict a lot owners use of their property. The association didn't do this 15 years ago. While the papers they submitted to the state said they possessed enforcement authority, in reality they did not. You can file anything you want with the county or state and they will take it without any question. The DEO looked at what they were given and nothing more. They didn't look at the original declaration of covenants and restrictions, they didn't look at the methods the club used to present themselves as the official mandatory association, and they sure as hell didn't look at MRTA-related judicial rulings. So where does that leave the neighborhood? The association would like you to believe that leaves you in their hands but in reality that leaves you and your property in a kind of legal limbo that will most likely end up in a costly legal battle. A common caution on this site is the risk of liability and their most recent newsletter demonstrates why having a corporation in charge of your property rights run by amateur volunteers is a bad idea. The most recent newsletter stressed the importance of following trash receptacle storage... unless you present them with some sort of hardship so they can grant a variance, which is a thing that is not permitted by those documents they claimed to love so much that they wanted revitalized. They warned homeowners not to park cars over the grass of their own lawns. This rule came out of nowhere. It is not found in their declaration they gave the state and it is certainly not found anywhere else yet the association has decided they can now make up rules out of thin air. What's next? Demanding homeowners get permission to re-roof their house thus bringing it up to code? Oh, wait. They have done that too even though they do not possess the authority of architectural control. 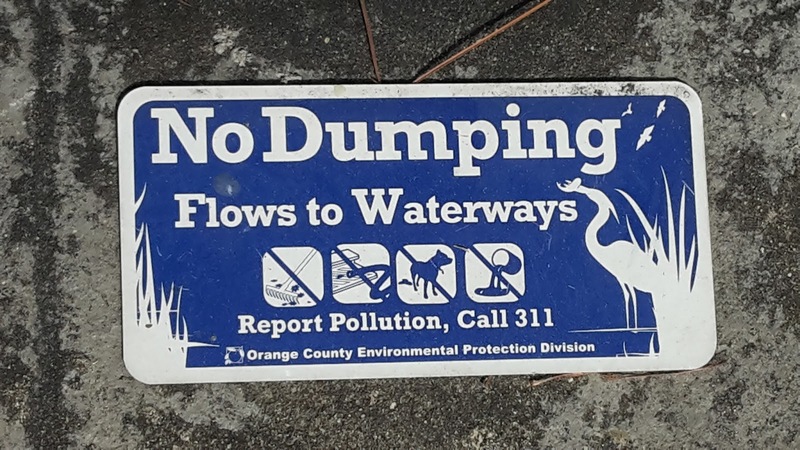 These things seem minor, but does it seem minor when the association tries to take away your home because of something like not putting your trashcan in the right spot or where you park your car? Sure they have no lien rights but that hasn't stopped them in the past. 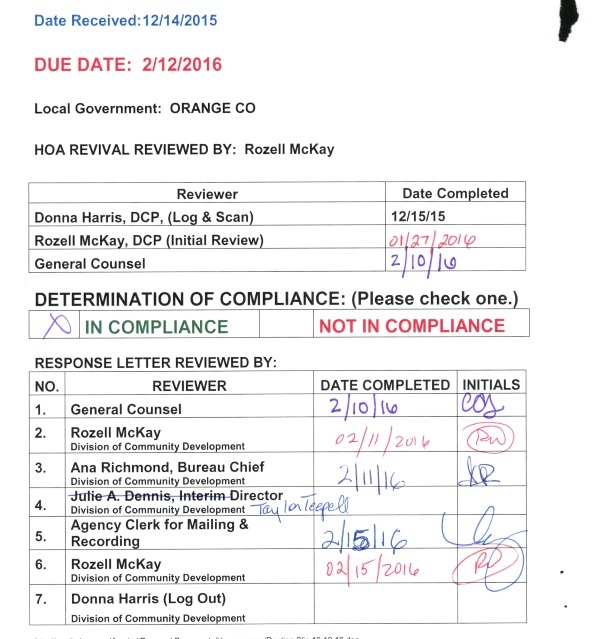 The latest newsletter from the association was delivered March 3rd and in it it claims that the Florida Department of Economic Opportunity reviewed their MRTA documents and "determined their compliance" so the association concludes that their revitalization has been approved. Here is the catch - the state only approves what they are given. In this case the association gave them a bunch of papers saying they were in charge before and will always be in charge and that people will be forced into mandatory membership and forced fines, fees, and assessments. The problem is that is not reality. The association gave the state their recent documents that they claim supports their current posting regarding liens, they lacked the legal authority to impose liens on a property. 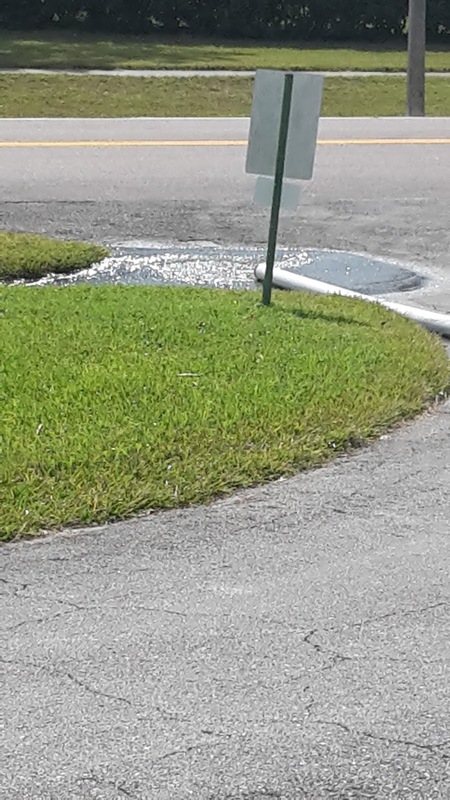 This is one of the defining aspects of a homeowners association. (9) “Homeowners’ association” or “association” means a Florida corporation responsible for the operation of a community or a mobile home subdivision in which the voting membership is made up of parcel owners or their agents, or a combination thereof, and in which membership is a mandatory condition of parcel ownership, and which is authorized to impose assessments that, if unpaid, may become a lien on the parcel. Ignoring the fact that the conversion to mandatory membership was not conducted properly, the association has admitted in their revitalization attempt that they do not have the authority to impose liens - a condition of the law. So if they cannot fulfill this simple requirement of the law then they cannot legally be in compliance with MRTA statutes. This is important because their actions and insistence that they can do this will cost the community thousands of dollars. Imagine the first lawsuit that challenges this. We are not talking about loopholes. We are talking about simple legal definitions. The association cannot even do that. Sadly the state doesn't have the resources or legislated authority to research every revitalization claim. Basically they make sure all the administrative "t"s are crossed and the "i"s are dotted. They don't check to see if what they were given adds up. Sounds like a shake down. And if you were wondering what happened with that threat from above? That property owner had their attorney notify the association years ago informing them that they lacked authority. Ever since then the association would send them harassing letters like the one above. They would never follow through. They just used these enforcement letters as an attempt to intimidate homeowners into paying them money (as well as making some extra money for the attorney) and many have indeed paid. Since they have openly admitted that they lack the authority to lien and foreclose, making such threats would be... ILLEGAL! So just remember to take every little bit of information from the association with a grain of salt because chances are they aren't doing you a favor and their actions can cost you in the long run. Lime Tree Village Dumps Chemicals Into Local Waterways? 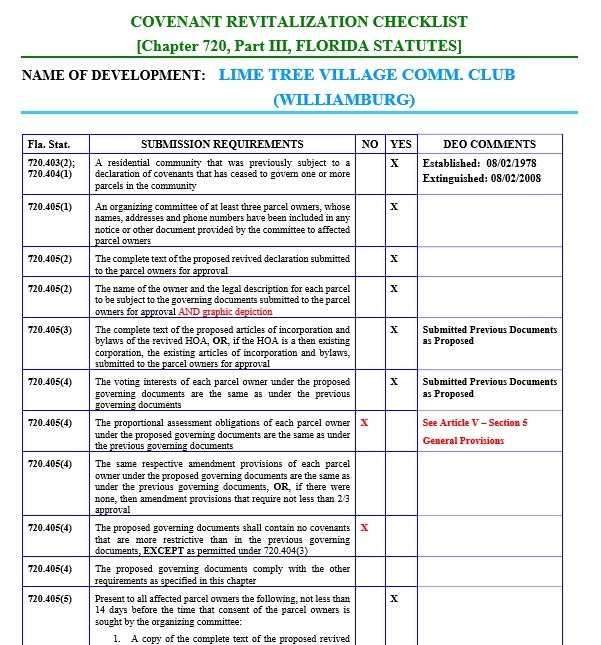 This website has reported in the past about various matters involving the Williamsburg community of Lime Tree Village and their propensity to make up rules as they go along. Mostly these reports were of the corporation purporting to be the homeowners association ignoring Florida statutes in an attempt to enforce expired land use restrictions or their blatant lies that they have been caught committing red handed (see previous posts regarding their illegal foreclosures). A common underlying theme to these posts are that the community is better off with no organization run by volunteers trying operate a private government and that their actions are a huge liability to the homeowners that are members. March 2nd, 2016 perfectly proved why. The corporation had closed down their pool and spa for maintenance but what happened afterwards was quite surprising - they dumped thousands of gallons of water into local waterways. Now it is unknown if it was being drained by corporation employees or their contracted help and whether or not they were aware but this is a huge liability for those who wish to be members. Imagine if the corporation got their way and forced you into membership (along with the risk of forced assessments). Now imagine if the corporation got caught dumping thousands of gallons of chemicals into fragile water ecosystems. Imagine the fines they would face. Now imagine where they would get the money to pay for such fines. Some homeowners contest that they had drained the pool weeks ago and that the they were just dumping water that had collected during maintenance but that does not negate the fact that only rain water should go down storm drains and that even if the pool contained excess water, it could also have had chemical residues from when it had been full. And this is why they need to leave us homeowners alone - it is one liability after another. You cannot spell LIEN without LIE! Did you all see the last newsletter that included a plea from the revitalization committee? The one where it stated they "have no lien rights and are not empowered to take your home away from you." Now why is this interesting? Because the revitalization committee (and the HOA) are lying. They have utilized liens and foreclosures unlawfully in the past. 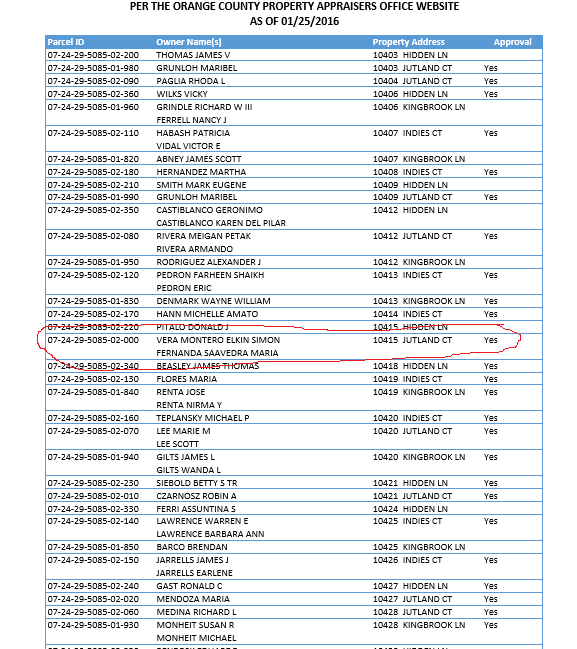 In case you were wondering, this was a foreclosure on a lien from the HOA for "delinquent" assessments at a time when the covenants and restrictions expired. Not only that, the HOA continued to file motions against this homeowner after they were notified by an attorney that the covenants and restrictions expired and they had no authority. Sadly the homeowner was unaware of the law and believed the association and their attorney at the time. Their property was foreclosed upon by the association and they were made to leave the neighborhood. The association took their home away. What is even worse is that they even charged this homeowner for "research" their attorney did into the legal rights of the HOA and the homeowner. Not once did they mention to the judge that there were no covenants or restrictions and that they did not possess any lien rights. Not to mention, the title search performed by the association would have shown that 30 years had passed from the date of the root title and that the covenants they were attempting to enforce were expired. So why are they making these claims that they have no lien rights and they cannot take your home away even though they had clearly filed liens and foreclosed on properties in the past? They are doing this because they want you to sign away your rights. The reason why they were able to get away with what they had done in the past is because the homeowners did not know their rights and in court, the judge can only make a determination based on the information presented. The Association made claims that they were owed money and did things like title searches and "legal research regarding homeowner claims and rights" and "review association documents." Most attorneys are not familiar with HOA matters or issues regarding the Marketable Record Title Act, and on top of that, lawyers who are typically represent associations because that is where the money is. When the association and their attorney attempted to collect "delinquent" assessments from other homeowners who obtained qualified legal counsel were pretty much left alone. They are preying on your ignorance of the law. Ask them about their past illegal foreclosures and see what their response is, and then ask yourself this question: "What is preventing them from lying in the future?" And if you think having new board members would make a difference, think again. Betty Gadd, the new president, was informed on May 5th, 2013 (and earlier in a written note) regarding the law and the association's rights. She was personally notified of the Marketable Record Title Act, legal definitions found in statute 720 defining what exactly a "Homeowners' Association" is, and even not-for-profit corporate law. She was even informed of other issues, like the collection of estoppel fees and how the actions of the association constitute fraud. Her response: "Thanks for the new information - we are still in pursuit of our Recall of the Board of Directors!" In one ear and out of the other. Once she became president of the association she pursued legal action against homeowners deemed "delinquent," she sought the collection of various fees in relation to the association's claims, and she continued to insist that covenants and restrictions were still in existence and enforceable despite simultaneously being on the revitalization committee for expired covenants! Also, by returning that signed form you make it that much more difficult to protect your rights should the association change their mind down the road. They Cannot Lien. They Cannot Revitalize. The new newsletter is out today and there was an interesting document on the front from the revitalization committee (who are also members of the board of directors). "We have no lien rights and are not empowered to take your home away from you." This is extremely important because this is one of the requirements to be allowed to revitalize restrictions. Florida Statute 712.01 defines a homeowners association as "an association of parcel owners which is authorized to enforce use restrictions that are imposed on the parcels," or as defined by Florida Statute 720.301. Florida Statute 720.301 defines a homeowners association as "a Florida corporation responsible for the operation of a community or a mobile home subdivision in which the voting membership is made up of parcel owners or their agents, or a combination thereof, and in which membership is a mandatory condition of parcel ownership, and which is authorized to impose assessments that, if unpaid, may become a lien on the parcel." As the revitalization committee just admitted, they do not meet the legal definition of a homeowners association since they lack lien rights, meaning they cannot legally revitalize. This means that what they are doing is illegal and they are opening up all those who sign up to thousands of dollars of liability. Their lack of understanding is not surprising. This letter also states that you received copies of the original restrictions (they failed to include the real original covenants mentioned on your deed that were filed in 1979) and in this very same newsletter they discuss the violation of the fiduciary duty of the previous board of directors and mention covenants and restrictions not being followed even though the covenants and restrictions no longer exist! Protect yourself and your property by not returning the joinder and consent form and stop allowing this amateur group of homeowners from wasting your money and bring your property value down. Also, their letter seems a very disingenuous. The law does not get rid of the HOA. It just gets rid of the covenants and restrictions. 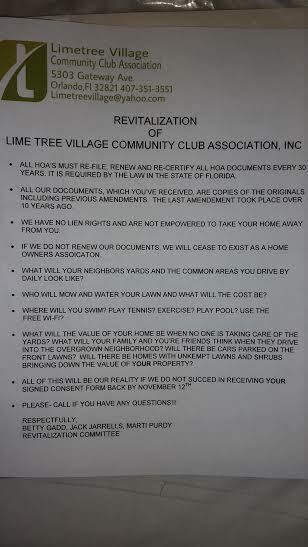 Lime Tree Village Community Club Association, Inc. is a corporation that will continue to exist, as they have been. They would be a voluntary organization (as they have always been in the past) and if you still want certain services, you could opt to join and receive such services. Those services may actually be cheaper if the association stopped wasting money on bad project management and attorneys. NOT MANDATORY! DO NOT SIGN! Are you under the impression that you have to sign and return the signature page for the association's revitalization packet? Not only that, their insistence in their restated restrictions that there is mandatory membership is wrong and that is because they never acquired 100% of the homeowners to approve in drastically changing the original covenants and restrictions. This neighborhood was not originally a mandatory one, and by law, if such a change were to occur you would require every homeowner to approve. Want an example of why this is the case? Imagine there are three properties. 2 of the homeowners are best friends and they do not like their neighbor so they decide to file a restriction on that person's property stating that their neighbor must now pay them $1000/year. They file covenants with the county stating 2/3 of the affected parcels approve the change. How would you feel if you were that one homeowner being forced to pay for something that didn't exist when you bought your property? They Don't Take Care Of Things! There really is no reason to but some people in the neighborhood want others to pay for their pet projects and they will do nothing to scare you into consenting and joining their corporation. The revitalization packet contained a letter that claimed you would have to pay nearly $100 for lawn care and over $30/month extra on your water bill. That is a huge lie! Ask a homeowner who is not a member today and they will tell you that is not true. 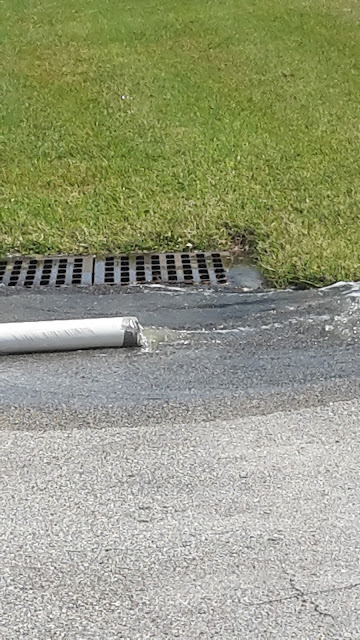 The association claims they take care of the drainage system in the community and if they were gone things would go into disrepair. 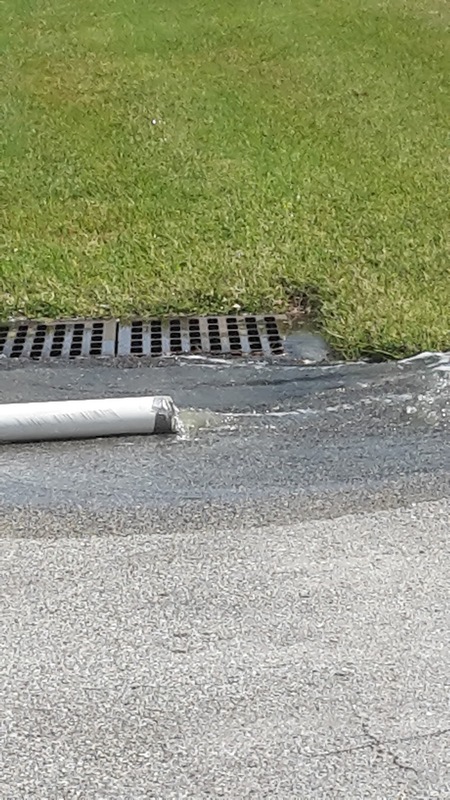 Do you see a drainage pipe? If you cannot see them fully, how do you expect water to flow appropriately? These drainage ditches are not maintained. The property belongs to the county and all the association does is mow them. They do not grade the ditches or unblock the drains. In fact, by simply mowing and not doing anything else they are contributing to the problem. 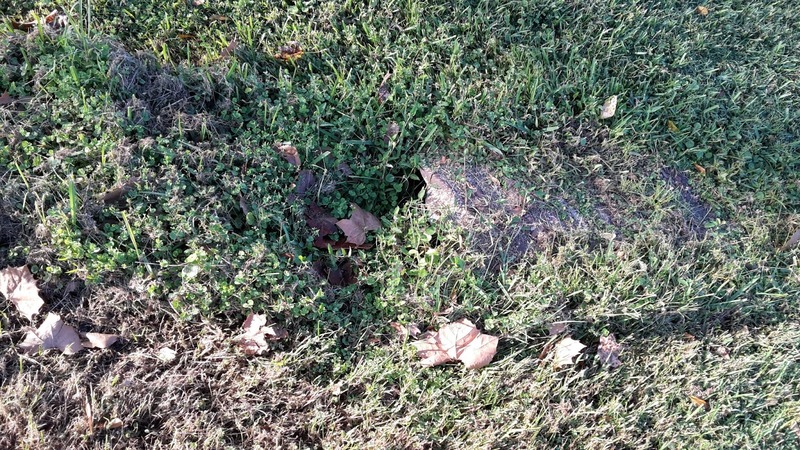 What you see are decades of grass clippings and sediment that have accumulated on this "maintained" drainage ditch yet the association claims they have been taking your money and putting it to good use. Ever notice how everyone's yard floods at the smallest rain shower? What Is That and What You Need To Know. Chances are you probably got a giant packet of paperwork in the mail from Lime Tree Village Community Club Association, Inc. This seems pretty important but what exactly does it mean? This cover letter sounds pretty scary. The cover letter touches upon some very basic financial stuff and pleads for the recipient to return the enclosed signature page, but again, what does it all mean? According to the letter, the $84* monthly dues cover lawn mowing, irrigation, a swimming pool, hot tub, tennis courts, pool table, and exercise equipment, and maintenance of "common areas," medians, islands, drainage, vacant lots, etc. The letter claims that if you do not sign the pages enclosed you would risk having to pay at least $35/month in irrigation costs and $85/month in lawn care. Let's look at those figures. "I bought a lawnmower a couple years ago when I left the HOA. I ordered one from Amazon and it was here in a couple days. It didn't cost much and still works. It barely uses any gas or requires much maintenance and it takes maybe 30 minutes every other week." Also, that $84 dollars is not set in stone. That number is meaningless. The covenants they want to revitalize state $55/year but they ultimately grant the power to change this in the by-laws. This is important because referring such an important subject in the restrictions to the by-laws is a way to circumvent membership. Passing changes in the by-laws is much easier than going to the membership. The board of directors can easily change that number to $1000/year without the homeowners' input. That same homeowner told us that they saw no increase in their water bill from when they left the association. "Since I left I have actually seen an improvement in my turf quality. The lawn care maintenance provided by the association sometimes cut too low or too often causing my St. Augustine to burn. Now I control the grass height and mowing and watering frequency. 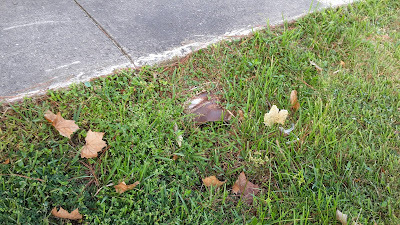 Besides, a few years ago the HOA removed virtually all the sprinkler heads in my yard. When I reported it they claimed 'vandals' must have dug out the heads and capped the lines. Losing watering service barely made an impact. Also, our proximity to Shingle Creek and our drainage system pretty much ensures our lawns receive enough water and nutrients. PLUS, we live in Florida. Nearly half the year we get rain showers every day." And as for those other benefits the HOA mentioned? 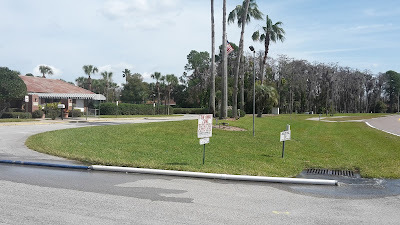 The medians, islands, and drainage are actually county property and if the HOA ceased maintenance, the tax dollars we already pay would go towards maintaining those areas, and if you ever looked at the costs the county charges, you would be crazy to pay a private corporation (that subcontracts it out) to do the same thing. The only reason the HOA maintains those areas are probably because the had entered into a use agreement with the county. Also, nearby fitness clubs go for a lot less and offer a lot more. So now that we are past the scary cover letter, what now? The second page is a really official document asking you to return the signature form to save money so we wouldn't have to hold a meeting, but why is that a bad thing? Wouldn't you want to ask questions? And if you don't know what to ask, this website has some really good ones. For instance, what is a "Joinder and Consent" form, what is it consenting to, if the association is admitting that the covenants and restrictions have expired, then would that mean that their enforcement for the last 5 years was illegal, and why should we consent to revitalizing the association when in their last newsletter they talked about how much money they wasted and how they screwed up royally? Question 1: What is a "Joinder and Consent" form? 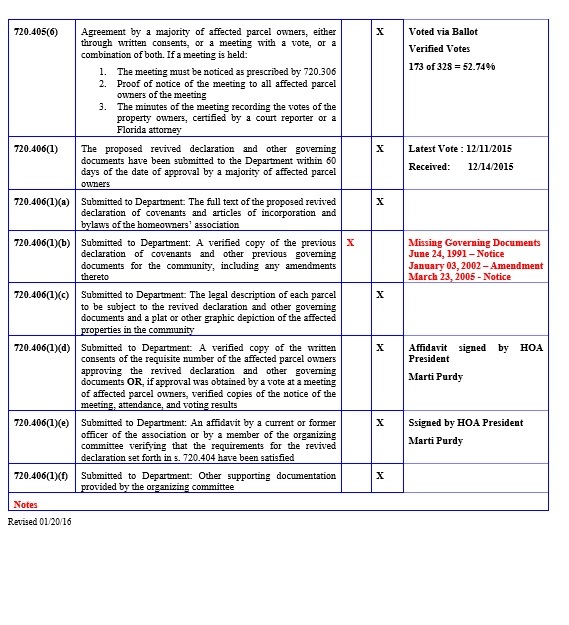 Basically, it is a document where a property owner acknowledges that they reviewed the paperwork enclosed in the envelope, that they understand they will be governed by the association and that they agree to the new set of rules and restrictions, and consents to them being filed with the county. All this information is actually on the form itself but it doesn't really detail what exactly it all is. Question 2: What are you consenting to? This is the frightening part. The association included in your envelope a bunch of different stapled documents. 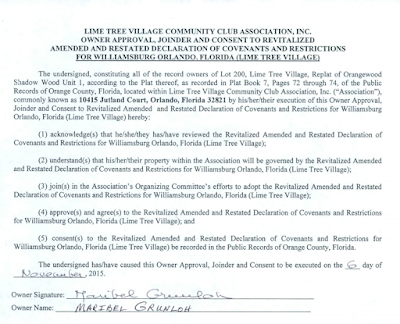 The most important document being the "Revitalized Amended and Restated Declaration of Covenants, Conditions and Restrictions For Williamsburg, Orlando, Florida (Lime Tree)." This document states that it is revitalizing a set of covenants and restrictions from 1980. The problem is that these are the incorrect set of covenants and restrictions. The law is very clear. The root title for all the properties refer back to a set of C&Rs from 1979 - not 1980. The restrictions the association seeks to revitalize are really C&Rs half the homeowners consented to years ago. They also include a series of other amendments, one being from 2002, in which they state that it converted the association into a "mandatory" association. The problem with this is that that amendment was passed with a simple majority, but legally, in order to convert into a mandatory association 100% of the affected parcels would have to consent. That did not happen. The original 1979 covenants only state a few negative restrictions that property owners had to abide by - none of them referencing an association, either voluntary or mandatory. Also, the document that you would be consenting to seeks to impose illegal restrictions on every other property in the neighborhood. This basically opens up the consenting parties to huge liabilities. By consenting to the documents being filed you are contributing to the clouding of one's title, affecting its marketability, and you can be sued for a lot of money. Question 3: Was the Association's enforcement over the last 5 years illegal? Every month the association published a newsletter insisting homeowners abide by the covenants and restrictions and pay their assessments. They pursued legal action against homeowners who did not pay or violated their rules. When informed of the expiration of the C&Rs they continued to act as though they were still valid. Even in their latest newsletter they discussed things like delinquent accounts or improper handling of estoppels. They did all this knowing their restrictions expired and they had no legal authority to act, They were also notified of which covenants and restrictions were subject to preservation 3 years ago when they filed a late preservation for the wrong set. Question 4: Why should we consent to revitalizing the association when in their last newsletter they talked about how much money they wasted and how they screwed up royally? The entire last newsletter was basically an ode to how much the association and the board of directors sucked at doing their jobs. They mentioned how a series of bad business deals left taxes unpaid and the corporation being owed thousands of dollars. Granted, much of their financial woes stem from their lack of understanding regarding community association management and the laws that are in place, but with that being said, why should we have any confidence in all in granting the association eternal governance over our properties when they openly admitted to screwing up completely for the last several years? It is obvious the author of these documents know nothing about the law. Ignoring the fact that they are trying to revitalize the wrong documents, the document also contains some illegal provisions, such as the restrictions regarding clotheslines or aerials. Florida has a law protecting solar capturing devices, banning neighborhoods from making restrictions against their use. Clotheslines are one such device protected by the law. Also, federal law prohibits neighborhoods from banning over-the-air reception devices. The FCC regulation, referred to as the Over-the-air Reception Devices Rule, or OTARD,is a preemption of restrictions on the placement of direct broadcast satellite, broadband radio service, and television broadcast antennas. The Association wants to revitalize documents, making fraudulent claims against every property in the neighborhood and opening up every homeowner to huge liabilities. 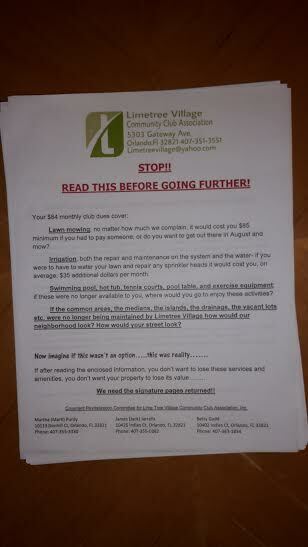 They use scare tactics to try and make everyone believe that leaving the association will destroy the neighborhood and cost everyone hundreds, if not thousands of dollars, more per year, and they will undoubtedly screw something up along the way. After all, they have screwed up so much over the last decade, including the simple preservation and revitalization process. Have you read the October 2015 Lime Tree News today? If you haven't then I must suggest you read it because it is a doozy. Everything this website has stated was pretty much touched upon in the newsletter, ranging from managerial incompetence violations of fiduciary duties to pursuit of invalid debts. The association's list of accomplishments is evidence of a group of know-nothing amateur-hour board members who accept zero responsibility for their actions against the homeowners of this neighborhood. The early termination of the Associa Management Co. contract (6 months early), for Breach of Contract and mismanagement in many areas, we agreed to sever the relationship. Replaced legal counsel and researched accounts to pursue collection from only 5 of the 17 that needed further legal follow up. Seems once again, no one was tending to business. The business the association is probably referring to is the illegal action against homeowners who have decided to enjoy their unencumbered property. The board of directors wanted to enforce some super strict set of rules on the residents of Lime Tree Village so they sent out enforcement letters against homeowners for things like dirty mailboxes, fences, rubbish in the driveway, or nonpayment of assessments. If homeowners rightfully ignored those illegal demands, the association would then send their attorney after the homeowner in hopes that they would pay. While some probably paid the association off to leave them alone, others fought back with a response grounded in statutory law and legal precedence. What do you think happened when their attorney was faced with the hard facts? Also, what exactly does it mean that they "researched accounts to pursue collection from only 5 of 17 that needed further legal follow up?" What about those other 12 homeowners? Consider this fact - The association was notified years ago that they cannot enforce the covenants, collect mandatory assessments, or pursue legal action because of the Marketable Record Title Act (MRTA). MRTA caused the C&Rs to expire in 2009. The year is 2015, 6 years after the expiration of restrictions and 3 years after notification that they were violating the law, and yet they are still attempting to enforce legally nonexistent rules and regulations. Maybe they changed legal counsel because they were trying to find a lawyer who would give them the answer they wanted. That is what has happened with disastrous results in other neighborhoods, like Sand Lake Hills. They had the same attorney as Lime Tree Village 15 years ago. They wanted to convert into a mandatory HOA (much like Lime Tree) and found an attorney who was willing to play fast and loose with the law to do so. They were eventually sued and lost big. Lime Tree is not too far off from that eventuality. Letters finally being sent to Homeowners with "late payments" and badly in arrears. Again, homeowners are not late when they choose not to pay because the restrictions no longer exist. This means that they are really not "badly in arrears." This means they are simply homeowners who decided not to pay to be members of a social club. 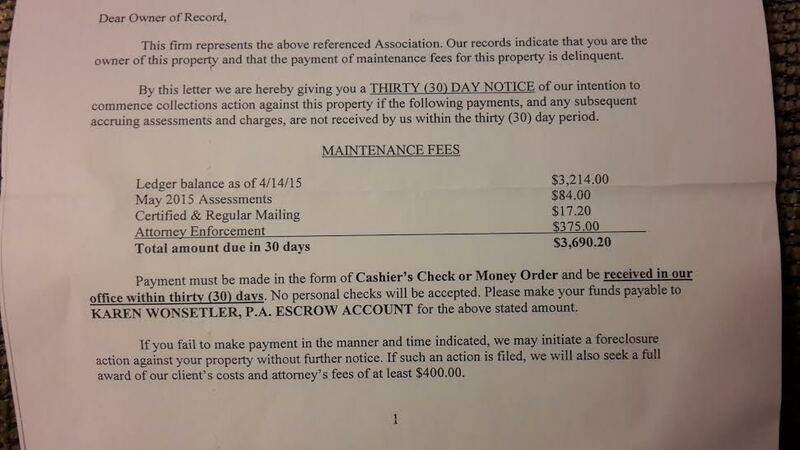 The association uses these letters, either from their management or from their attorney, as a method of intimidation knowing that most people when faced with a threatening letter demanding payment or face exponentially more in legal fees will pay. As a reminder: YOU DO NOT HAVE TO PAY! Pursuit of money owed from Associa: $10,000. Water Bill, Estoppels that were incorrectly presented and charges for excessive office supplies and fees. This is laughable. The association is upset for charges of excessive office supplies and fees yet they try to impose an illegal assessment on every homeowner in the neighborhood, as well as the collection of exorbitant legal fees for the pursuit of delinquent illegal assessments. Hypocritical much? Also, as mentioned on this website (see title "Told You So"), they have been illegally notifying lending institutions of obligations a potential homeowner may face and collecting estoppel fees from said homeowners for amounts due. It possible that these "incorrectly presented" estoppels were not incorrectly presented, but merely correctly presented and rejected estoppels? In basic terms, an estoppel is basically a certificate that tells a lender how much a parcel owes an association. Since the restrictions no longer exist, a property may not be obligated to pay the association any assessments, but the association believes otherwise. What they have been doing is telling banks that homeowners who do not owe them a dime are in debt to them. It is possible that Associa did their job and presented the correct information - that the association was owed no money - and that is why the association now believes they are in the hole to the tune of $10k. Pursuit of $1100, unaccounted for gift cards issued by previous Board. How would you feel if you lost $1100? That is exactly what the association has done - they threw away money. Who knows what they sued it for? New golf clubs for the vice president? A car wash for the treasurer? A birthday present for the secretary? Remember when I mentioned zero accountability? There were members of this current board that served on this previous board. Interview and hire a second LCAM after the first one quit without notice. This one is a no-brainer. They hired a guy who supposedly had years of experience managing HOAs but his resume consisted of years working at Lockheed Martin as some kind of engineer - not a business manager. And now their new one being "trained" is nothing more than a real estate agent. So basically this letter made a few alarming but not surprising admissions. The amateur board swindled hundreds of homeowners and mismanaged their funds. The association will continue to swindle Lime Tree residents, attempting to enforce illegal covenants and restrictions and collect on invalid fines, fees, and assessments. Whatever happens, the board of directors believes nothing is their fault. So, as a helpful reminder, remember that the covenants and restrictions on Lime Tree expired and that you no longer have to pay them money. You sort of did not have to pay them before, being that their conversion was invalid because they did not acquire 100% approval to convert the neighborhood into a mandatory association, but that is a whole different story and that point is moot since MRTA took affect, so just be safe and never let your guard down. There are always some incompetent folks out there who will stop at nothing to tell you how to live your life in your own home. Back in July the Association was proud to announce that their foray into outside management utilizing Associa was almost to a close. This is probably because Associa could not deliver what the Association wanted - utter subservience. The Association bragged about the record-breaking enforcement threats sent out across the neighborhood, and while some surely complied because they felt intimidated, I for one can attest that these notices were nothing more than illegal, idle threats that some simply ignored. So, in July, 2015, the Association brought on Tim Broughton to turn things around. He allegedly had 18 years experience "[working] with many other HOA's [sic]." A whole new round of enforcement letters were sent out, and again, while some surely complied, they were nothing more than illegal harassment. The Association's attorney, Karen Wonsettler, sent out threats to some demanding years worth of assessments and legal fees over issues the Association and Wonsettler herself were notified about years prior (the expiration of the covenants and restrictions due to the Marketable Record Title Act) or else they would drag homeowners to court. Some homeowners responded to these threats and the Association did nothing. Because their actions were illegal and they could only continue by intimidating those who were ignorant of their rights. The jig was up and so they would move onto their next mark. Fast forward just three months and now we have a new CAM - Kathy Figueroa. According to the Association, Figueroa comes from a management company but "has never managed a homeowner's association on her own." It also appears that Figueroa is a real estate agent so it is also fair to say there is a conflict of interest because of who she claims to represent at any given time. Are a homeowner's best interests taken into consideration when she sells a property in the neighborhood and lies to them, stating the Association is mandatory and they have to pony up the dough to live in their home harassment free? Also, for those who believe in the Association, do you want some amateur operating a corporation that claims authority over your biggest lifetime investment? So as always, here is a bit of a reminder for those who have visited this site or are aware of the affects of the MRTA on Lime Tree Village, or those who are new - the covenants and restrictions have expired for this neighborhood. That means the Association cannot tell you what to do or how you do it. That means you do not have to pay them hundreds of dollars each year. This means you can live in your home and not worry that some poorly run corporation may become a liability. As a warning, please be prepared for renewed illegal enforcement attempts. Typically these "managers" like to prove their management material by showing results and so they usually bring out the big guns in the beginning to hope we all fall in line so be careful. Always know your rights and do not be afraid to say "no." I apologize for the lack of updates recently. I had made some previous edits but was unaware that they did not show when people visited this site. I have made the appropriate changes and have made sure that these new features are on full display. The one change that was, in my opinion, the most important, was a link offering referrals for reputable attorneys in Central Florida who are not only willing to represent homeowners against HOAs, but are also knowledgeable of the various laws that govern them. In many instances HOAs are such a niche that many attorneys and law firms tend to represent primarily associations because that is where the money is and so other attorneys who may represent individuals may not know the legal nuances. You can visit the new "Lawyers" page by either clicking here or on the menu to the right. 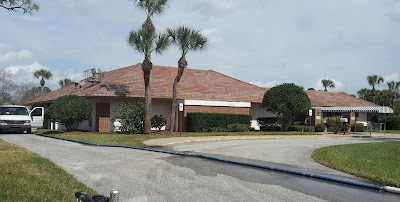 Currently we only have one attorney listed (Fred O'Neal) but we plan on offering more in the future in the spirit of offering a number of choices for your legal needs (although we have a soft spot for Mr. O'Neal for all the great work he has done in Lime Tree as well as in other neighborhoods in the area). I would also like to update the neighborhood and reiterate the message of this website to the community that Lime Tree is still covenant free! Recently the HOA has decided to change management. This is probably because they changed to a corporate management firm to increase funds, and by funds I mean increased fines and fees on the good homeowners of Lime Tree. 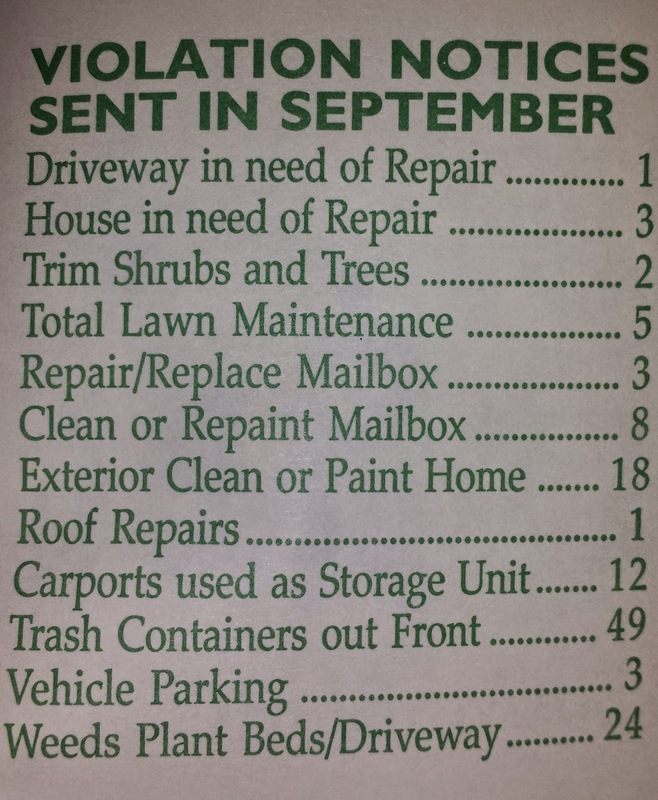 My last post was regarding the HOA gloating about how many violations they had found in the neighborhood in just one month. The way these companies work is that they enforce the covenants and get a cut. The problem was that with Lime Tree we have no legal enforceable covenants or restrictions. That means that they could threaten you with legal notices or invoices all they want, they could not legally collect. I knew of homeowners that received several enforcement letters from the management company for sill things like a "dirty mailbox." Those letters were dismissed and nothing came of it. That is because they could not collect. 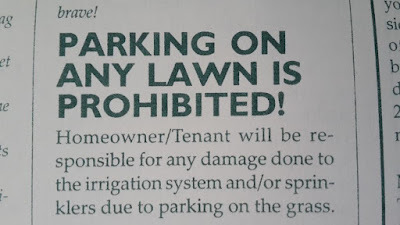 So, the HOA has changed management and most likely the new manager probably promised to collect delinquent assessments and enforce the covenants on everyone with a vengeance. I know of a homeowner who received a letter from the HOA's attorney demanding thousands of dollars in payment for years-old delinquent assessments plus attorney's fees. This letter was in violation of federal and state debt collection statutes because the HOA and their attorney were notified years ago of their lack of legal authority to collect anything from anyone. 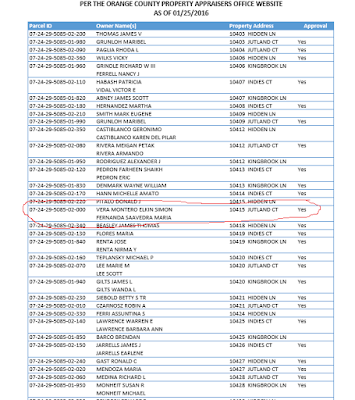 They were notified by an attorney of their illegal actions and guess what? The HOA backed off! The attorney threatened legal action if the homeowner did not pay. The homeowner did not pay and the homeowner was left alone (for now). Sadly this happens everyday but many homeowners just pay because they are scared, and with good reason. HOAs and their attorneys threaten thousands of dollars in fines and fees when they are in the wrong and many homeowners are unaware of their rights. 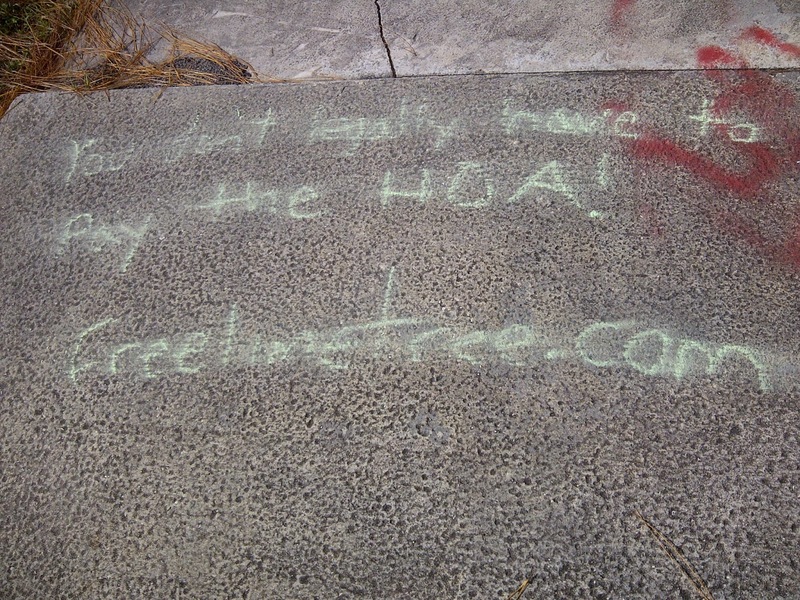 So remember - the HOA is acting illegally when they threaten you for non-payment! If you don't want to be a member then save your money! Use that to treat your family to a well-earned vacation or make that home improvement project a reality! The money I saved from not being a member has gone to 2 bathroom remodels, a kitchen remodel, new floors for the entire house, new appliances, attic insulation, re-piping the entire house, etc. Think about it like this - the HOA promises increased property values through the enforcement of covenants and restrictions. 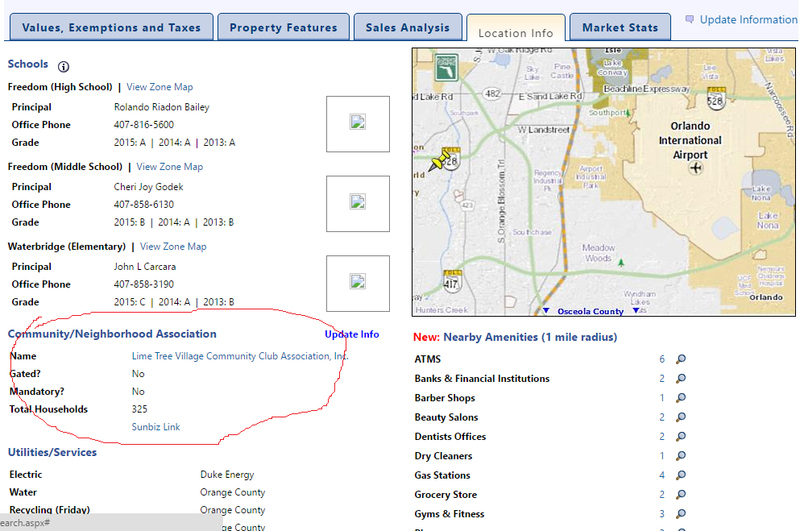 Sadly that is not how Orange County property appraisals work (I know- I talked to a property appraiser). What does improve property values are the things I just mentioned above. Not to mention, these homes are 40 years old. Improvements like replacing the old aluminum single-pane windows or weatherproofing not only increase property value but also save money by saving on your power bill or increasing your level of comfort. 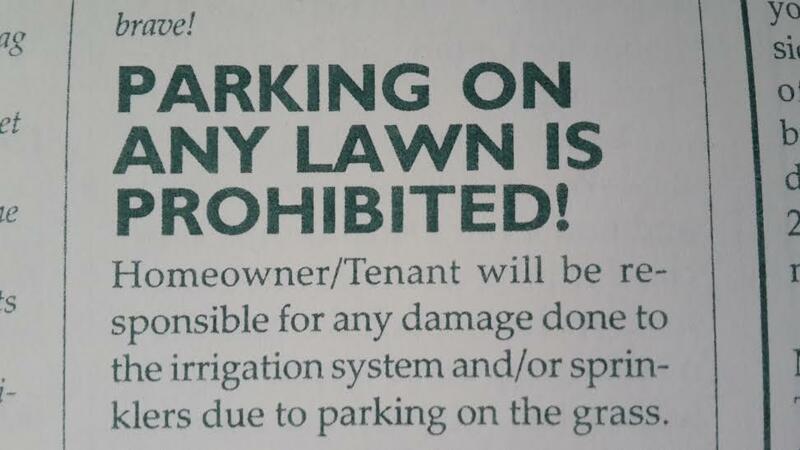 So again, don't feel intimidated by the HOA. Live your life and enjoy your home.